Swift was in limelight during last 2 years and was ranked #1 most loved programming language of 2015. It is a general purpose, multi-paradigm, statically typed language. Developed by team led by Chris Lattner at Apple. In this blog, I will be explaining why and how swift achieves above mentioned qualities. Swift is a strongly typed compiled programming language. This makes it a very safe programming language. Swift is very strict about types, and it verifies that all types are used correctly in the source code. It catches many issues at compile time. Swift is also a static programming language. Its source code is compiled to the assembly code and the assembly code is compiled to the machine code using the LLVM tool. Running native machine code instructions is the fastest way of doing this. In comparison, Java and C# are compiled to a piece of intermediate code, and it needs a virtual machine to run it, or another tool that will translate it into machine instructions. Because Swift doesn’t do this at runtime, it has a very big performance gain. By mixing strongly typed rules and compiling to assembly code, Swift can analyse code very well and perform very good assembly code optimization. Swift is also built to be nice to write, with a pleasant and clean syntax and modern features and types. This unique combination of syntax, powerful features, safety, and performance makes Swift a very amazing programming language. First, the Swift source code is transformed into an AST (short for Abstract Syntax Tree). Then, it is transformed into SIL (short for Swift Intermediate Language), first into a raw SIL and then into a canonical SIL. After that, it is transformed into LLVM IR (short for Intermediate Representation). In this step, LLVM takes care of the rest. It takes IR, does an optimisation, and produces an assembly and, after that, an executable for a specific architecture. The interesting part in preceding diagram is the steps for generating SIL. It’s a Swift-specific optimisation and it was created specifically for swift. Other programming languages, such as C, don’t do this optimisation before they generate LLVM IR, and they have one less optimisation step. 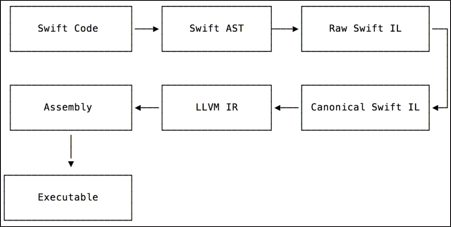 The swiftc compiler compiles swift code and produces the result, but it doesn’t execute it. Depending on the option, you can get a binary file, an assembly, an LLVM IR representation, or something else. With swiftc, it’s possible to generate the results for each of those steps. It’s incredibly useful for code optimisation analysis. To see all the available modes, just run xcrun swiftc -h. Now, let’s quickly take a look on them. This AST code represents the var a = 10 Swift code. Each instruction is parsed into a separate tree node and then put together in a tree representation. You can find more information about Clang’s AST at http://clang.llvm.org/docs/IntroductionToTheClangAST.html. The SIL represents Swift code in a mangled format. The names contain a lot of information about the type, the count of symbols in the name, and so on. Some mangled names can be very long and hard to read, such as _TZvOSs7Process11_unsafeArgvGVSs20UnsafeMutablePointerGS0_VSs4Int8__. If you want to learn more about name mangling, you can read a great post about it written by Mike Ash at https://mikeash.com/pyblog/friday-qa-2014-08-15-swift-name-mangling.html. It is very difficult to analyse the assembly code generated by the swiftc compiler. To make our lives easier, we will use a Hopper Disassembler tool to disassemble executable files, generating a piece of pseudocode and analysing it. You can download the free version of Hopper from http://www.hopperapp.com. The Hopper Disassembler tool can work with binary, executable, and object files. The easiest way of using it is by generating an executable file with the swiftc main.swift command and opening it in Hopper. You can simply drag and drop the main executable file to open it in Hopper. On the left-hand side, you can find all the labels for functions and variables and navigate to them. The search feature is very useful when you are analyzing a big project with many functions. In the center is an assembly code; you can press Alt + Enter to see the pseudocode for the current procedure. It is much easier to analyze high-level pseudocode. We can also compile an application in Xcode and disassemble our SimpleApp.app in Hopper. This allows us to analyze very large and complex applications as well. So, that’s all on compilation process for a swift, I hope you did get the reason behind Tim Cook calling Swift a Fast, Safe and Interactive language. I guess I missed Modern, because I reckon that’s a topic for another writing.